Re-experience the critically acclaimed, genre-defining game that started it all. Beautifully remastered for your return to Lordran in stunning detail. 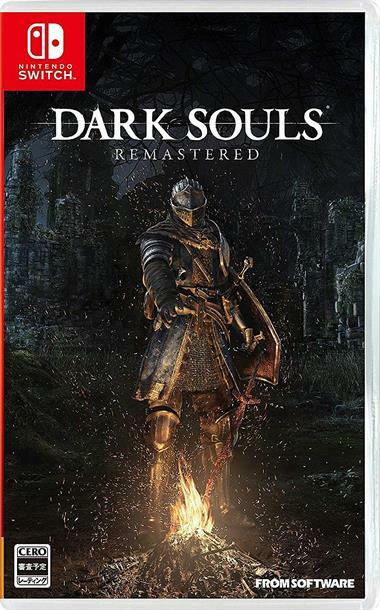 Dark Souls: Remastered includes the main game plus the Artorias of the Abyss DLC. This marks the franchise's debut on a Nintendo platform and for the first time ever can be played on-the-go with Nintendo Switch. » Deep and dark universe - Delve into an epic dark fantasy universe stricken by decline and the Curse. Explore its intricate world design - full of hidden passages, dungeons and secrets - and uncover its deeply rooted lore. » Each end is a new beginning - Each playthrough surprises you with new challenges and unexpected facets of the game. Don't bet on completing the game only once. » Gameplay richness and possibilities - Hundreds of unique combinations of weaponry, armor, magic and crafting options to create your own play style and gaming experience. » Sense of learning, mastering and accomplishments - From your first steps to mastery, build your character while refining your playing skills. » Learn to strategize freely and experience the rewarding taste of overcoming daunting foes. » The way of the multiplayer (up to 6 players with dedicated servers) - Whatever your motivations are to play online - collaboration or confrontation, support or betrayal - you'll find your true home among the Nine Covenants. Which allegiance will you choose? Preorders are welcome to ship on October 16, 2018. While supplies last, early preorders will include a miniature H7cm (2.75") bust of Senior Knight.